If I would’ve known how easy it was to keep chickens, I think I would have started to raise my backyard chick-chick flock so much sooner. The truth is that I spend about 5 min per day on them, and they are three very happy and plump chicken ladies. Tingeling (orange) is at the top of the pecking order, our mother-hen chicken leader. She is also the toughest and bravest of the three. She always comes running when she sees me, and she lets me take her up for a cuddle. She is an “Isa Brown”, a Sexalinks Hybrid. She lays one egg per day, all year around. One BIG pinkish brown egg with white sparkles. Delicious! Isa Brown chickens lay around 300-320 eggs per year. Gittan (black) is a black Harco chicken (a Black Rocks breed), an excellent egg-layer of 280-300 eggs per year. She is a little shy, but has the same body build as Tingeling. They are BFF’s, Tingeling and Gittan. Her eggs are smooth and dark brown, she likes to spend hours before laying them. And she always lays them around my lunch hour, which stops me from eating fresh eggs for lunch. I don’t want to disturb her. She is usually done around 2 pm, so if I take a late lunch, I’ll get a warm, fresh egg on my toast! 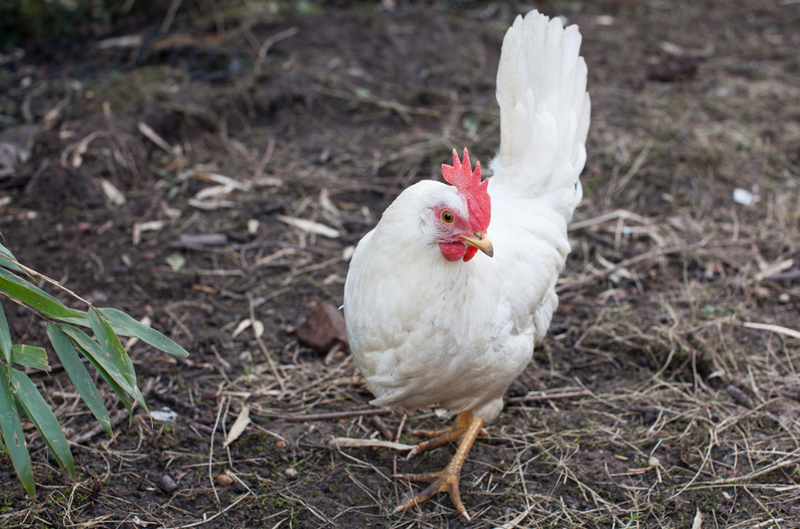 Lotta (white) is the difficult one… She laid one egg, ONE egg, her first 6 month with us. We though something was wrong with her first, but after some research we understood that White Leghorn Chickens don’t lay eggs during the winter. Her eggs are really tasty, a real treat! And it’s so pretty to see her pure white and smooth egg in the nesting box. She is very shy, she doesn’t like to come near us, but she is much more relaxed now and has started to trust us. She does a funny little thing… The other two gladly lay their eggs on top of the other one’s egg, but not Lotta. Oh no, she gets really annoyed if there is an egg in the box when it’s her turn. She hides the other eggs by throwing straws on top of them, then makes a deep little nest for herself where she lays her egg. 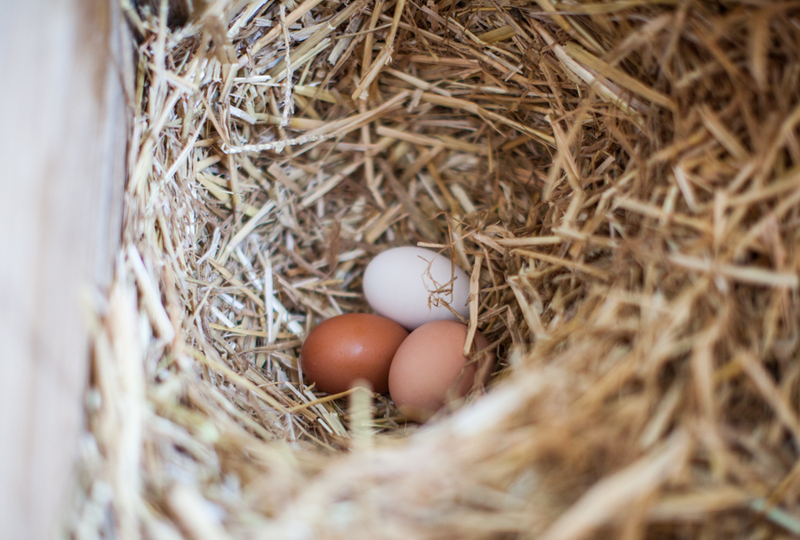 If we see a Lotta-egg in the nest, you have to dig around to find the other two eggs! Morning: We open the (big to stand in) cage where they have been pecking around in the hay since dawn. I give them about 1 dl each of chicken food (as they are free range chickens, they see to most of the food on their own. They have a huge space to roam around freely. I check that they have enough water (they can never run out of water!) and then I open the roof to the chicken coop, grab a small garden fork and start poking away the poop from the night. I put it all, straw and poop, in a pile next to the cage. Once a month I collect all the straw and throw it on the compost. During the growing season we keep them behind the garage, where a locked fence keeps them away from the vegetables, but during the winter they have access to the entire garden! Lunch: I go for my first egg-collecting and to check that everything is ok. Most of the time it’s just in and out, as the nest is busy and I don’t want to disturb. I do like to sit down to stroke Tingeling for a while (she likes it too!) and to talk to them or give them worms if I find any. Late afternoon: This is when I usually pick up the eggs of the day. Most of the time there are 3 pretty eggs in different colors waiting for me. – They live in a small chicken coop, which is basically just a box with a roof, filled with straw. I always thought I needed to have a special place for the egg-laying (a nest box), but if I keep the routine of taking away the poop in the morning, I never have any accidents with soiled eggs. 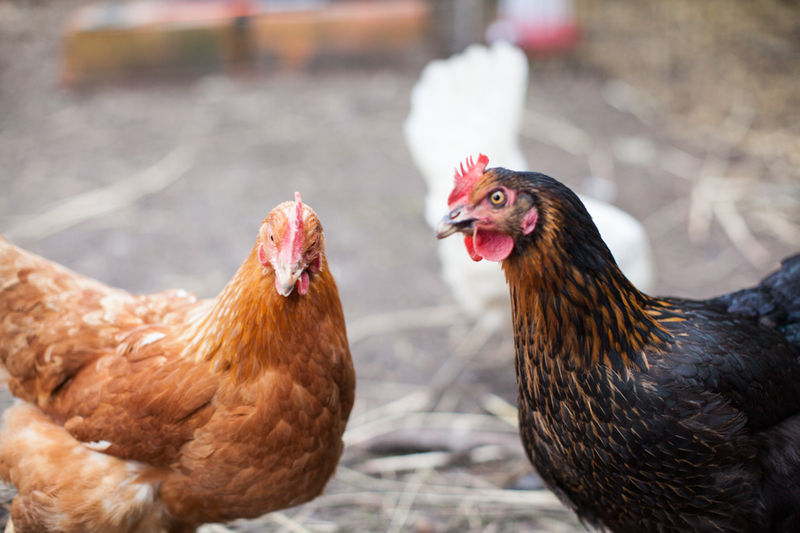 – The chicken coop is located in a big metal cage that also runs underground (3×3 m wide and 2 m high). There is a tarp on the roof to protect from the rain. The food dispenser is attached to the cage, in perfect chicken height. The water dispenser stand right on the ground for now. I need to change that as there is straw in the water constantly… The cage is big enough to keep chickens in all the time, but I like to give them more space, which is why they have the entire area behind the garage. They love it! It’s their (and my kids’) play ground. This is where we have our composts, there is a bamboo bush that they love to play under, there is also a big pine tree, with loose, dry ground underneath, always protected from rain. This is where they clean up themselves. Chickens stay clean by “dust bathing”. I just cut down all the ornamental grass, we are cutting it down to small pieces to use as straw in the chicken coop, but for now, my kids like to sit on this huge bed of dry grass and play with their feathered friends. Loves it! Jag undrade just hur det var med era höns och hur de klarade vintern etc. Vill gärna besöka er. Kram!! Previous article The Edible Garden Project 2015 – part 6. The real thing now!